Be sure to bookmark and read the St. Thomas Times-Journal which, so far, appears more committed to local coverage of the Ontario election than most other newspapers in the province. Paul McKeever is Freedom Party of Ontario’s candidate in the riding of Elgin-Middlesex-London, which includes St. Thomas, so the St. Thomas Times-Journal may also prove to be a valuable news source about province-wide issues discussed by Ontario’s political party leaders as election day (October 6, 2011) approaches. 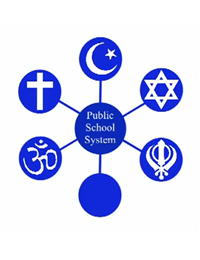 This video was released to promote the party’s 2011 election plank: Separating Public Schools and Organized Religious Practice. 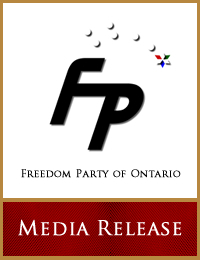 Freedom Party of Ontario’s 2011 Election Plank: Separating Public Schools and Organized Religious Practice. “Ontario’s Liberal and Progressive Conservative parties have refused to do anything to prevent Ontario’s public schools from being used for religious purposes: the distribution of religious texts, organized prayer, etc.. Freedom Party today is blaming Liberal-Conservative inaction on both a 2009 Liberal mandate that facilitates such measures, and a deliberately understated plan by Tim Hudak’s Progressive Conservatives to give parents religious school options within Ontario’s public school system…”. Click here to read the full media release. On Friendly Fire (NewsTalk 1010AM CFRB, Toronto, Ontario, with hosts Ryan Doyle and John Downs) Paul McKeever, leader, Freedom Party of Ontario discusses Freedom Party’s proposal to separate public schools and organized religious practice, and the question of whether the Tim Hudak Progressive Conservatives’ are planning to create religious choices within Ontario’s public school system. August 2, 2011 – Radio Interview: Freedom Party leader Paul McKeever was interviewed today by Ryan Doyle and John Downs of “Friendly Fire” (NewsTalk 1010 AM, Toronto). The topic: Freedom Party’s plank, released today, on the separation of public schools and organized religious practice. 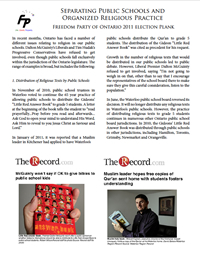 The discussion focused primarily on the Tim Hudak Progressive Conservatives’ deliberately quiet plan to create religious schools within the public school system. Click here to listen.